Abstract — The investigators conducted a double-blind randomized crossover study to determine the effects of prosthetic foot forefoot flexibility on oxygen cost and subjective preference rankings of 13 unilateral transtibial prosthesis users. Five experimental feet were fabricated for use in the study: F1, F2, F3, F4, and F5. 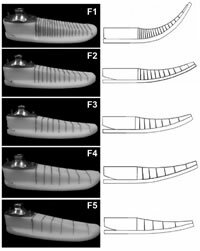 F1 was most flexible, F5 was least flexible, and F3 was designed to conform to a biomimetic ankle-foot roll-over shape. The experimental feet were modeled after the Shape&Roll prosthetic foot (originally produced by Northwestern University, Chicago, Illinois; now in public domain) but had different numbers of saw cuts within the forefoot members, allowing more or less flexibility during walking. Participants walked at the same comfortable, freely selected speed on the treadmill for 7 min with each foot while energy expenditure was measured. No significant difference was found in oxygen cost (mL O2/kg/m) between the different feet (p = 0.17), and the order of use was also not significant (p = 0.94). However, the preference ranking was significantly affected by the flexibility of the feet (p = 0.002), with the most flexible foot (F1) ranking significantly poorer than feet F3 (p = 0.003) and F4 (p = 0.004). Users may prefer prosthetic feet that match the flexibility of an intact ankle-foot system, even though we did not detect an energetic benefit at freely selected speeds. Key words: artificial leg, artificial limb, biomechanics, energy expenditure, foot, leg prosthesis, oxygen cost, prosthesis, trans-tibial, treadmill. Abbreviations: ANOVA = analysis of variance, ESAR = energy storage and return, SACH = solid-ankle cushioned heel, VA = Department of Veterans Affairs. *Address all correspondence to Andrew Hansen, PhD; Minneapolis VA Medical Center, One Veterans Drive, Minneapolis, MN 55417; 612-467-2910. Lower-limb prosthesis users expend more oxygen per unit distance (oxygen cost) during walking than nondisabled participants . Energy cost and expenditure also correlate with level of amputation  and residual limb length  and have more recently been used in attempts to quantify differences between prosthetic feet within a population of prosthesis users. Three previous investigations on unilateral transtibial prosthesis users reported reduced energy expenditure with the use of energy storage and return (ESAR) prostheses compared with the solid-ankle cushioned heel (SACH) foot [4-6]. Seven other reports found no difference in energy expenditure with the use of the SACH and ESAR feet in persons with unilateral transtibial amputation [7-13]. The results of these studies suggest inconsistent effects on energy expenditure in persons using various types of prosthetic feet. Multiple structural and material differences exist between most prosthetic foot types, making it difficult for researchers to determine prosthetic foot features that contribute to significant differences in energy expenditure when they occur. We believe a more structured examination of prosthetic foot features is needed to build our core knowledge of prosthetic foot mechanics and their effects on energy expenditure of prosthesis users. Therefore the purpose of this study was to examine the effects of one prosthetic foot feature, forefoot flexibility, on oxygen cost and subjective preference ranking of unilateral transtibial prosthesis users. A series of five experimental prosthetic feet (F1, F2, F3, F4, and F5) with different levels of flexibility was used in this study. The F3 prosthetic foot was designed with a forefoot flexibility that most closely provided the effective rocker radius created by the nondisabled ankle-foot system during walking . The other four prosthetic feet were designed to have flexibilities below (F4, F5) and above (F1, F2) the F3 foot. Modeling and empirical work by Adamczyk et al. suggests that the biomimetic rocker radius may provide an energetic benefit over other rockers for walking . Therefore, we hypothesized that the biomimetic F3 prosthetic foot would significantly reduce oxygen cost while walking and that prosthesis users would prefer it over the other feet in the study. Persons with unilateral transtibial amputations were recruited to participate in this study. The research protocol and informed consent process were approved by both the Northwestern University Institutional Review Board and the Research and Development Committee of the Jesse Brown Department of Veterans Affairs (VA) Medical Center. All participants completed the informed consent process before participating in the study. Recruitment criteria included having a minimum of 1 year of experience walking on a definitive prosthesis, being a functional ambulator without serious complications, having the ability to walk without the use of assistive devices such as canes or walkers, and having an age between 18 and 80 years. Participants in the study were involved in four visits: (1) consent and initial anthropometric measurements to allow for prosthetic foot fabrication, (2) alignment and accommodation, (3) gait analysis with each foot , and (4) energy expenditure testing with each foot. Five versions of an experimental prosthetic foot modeled after the Shape&Roll prosthetic foot (originally produced by Northwestern University, Chicago, Illinois; now in public domain) were fabricated according to the procedures in Sam et al. , but without saw cuts in the forefoot region. Each version was cut and sanded such that it could fit inside a commercially available foot shell corresponding to the user's intact foot size. 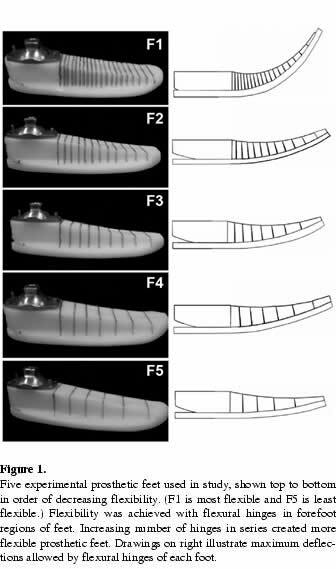 Different numbers of saw cuts were made in the forefoot region of each of the five experimental feet to provide different levels of flexibility (Figure 1). Each cut creates a flexural hinge similar to a rotational spring. Groups of hinges can be thought of as springs in series, which act to reduce overall stiffness. Therefore, prosthetic feet in the study with higher numbers of cuts are more flexible. In all other respects, the feet were identical. The number and placement of the cuts were determined by a custom MATLAB program (MathWorks, Inc.; Natick, Massachusetts) for different roll-over shape radii of 15, 25, 35, 45, and 55 percent of leg length when all cuts were closed. The F3 prosthetic foot was designed with a forefoot flexibility that would most closely mimic the roll-over shape created by the nondisabled ankle-foot system during walking  (i.e., having a radius of approximately 35% of leg length). 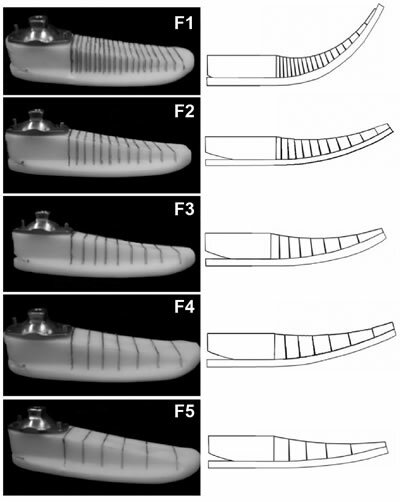 The F1 and F2 prosthetic feet were designed to have higher numbers of cuts, yielding more flexibility, while the F4 and F5 prosthetic feet were designed with fewer cuts, yielding reduced flexibility compared with foot F3. Post hoc testing of size 24 cm experimental feet in an MTS testing machine (Eden Prairie, Minnesota) at a loading angle of 20?? on the forefoot yielded 28 mm deflection at 1,000 N for the F1 foot and 18 mm deflection at 1,000 N for the F5 foot. After the specific cuts had been made in each prosthetic foot with a bandsaw, the feet were covered by a sock and inserted into the cosmetic foot shell. This procedure and other operations that might identify the foot component were performed by a technician to ensure that the prosthetist and research participant remained blinded. Although two qualified prosthetists performed alignments of the experimental prostheses during this study, each research participant had all his or her experimental prostheses aligned by only one of the prosthetists. The participant's usual prosthesis was disconnected at the socket/pylon junction in a way that preserved the alignment of his/her usual prosthesis. The alignment was preserved by backing off two adjacent nonprotruding screws at the socket/pylon junction. These two adjacent screws were then tightened when the pylon and foot were reattached to the socket at the end of the session, maintaining the same alignment. The first experimental foot-pylon assembly was then attached to the socket and aligned by the prosthetist following the standard static and dynamic alignment procedures used in clinical practice. Once alignment was completed to the prosthetist and prosthesis user's satisfaction, the participant walked at a freely selected speed over level ground for approximately 435 m (five laps through a series of hallways) and on a level treadmill for 5 min to accommodate to the foot. The prosthetist made additional alignment adjustments during or after the accommodation period if desired by the prosthetist or prosthesis user. After the accommodation period was completed for the first foot, the technician backed off two adjacent screws of the pyramid adapter at the socket-pylon connection (while keeping the other screws fixed in position), disconnecting the foot-pylon assembly in a way that preserved alignment. This process was repeated for the remaining four experimental foot-pylon assemblies, preserving the alignment of each foot for subsequent testing sessions. The order in which the five experimental prosthetic feet were aligned was assigned randomly and both the prosthetist and the research participant were blinded to the foot condition. After accommodation to the second, third, fourth, and fifth prosthetic feet in the study, the participants were asked to rank their overall preference for the feet tested (1 being their favorite foot and 5 being their least favorite). If participants had preferences that were indifferent for a number of feet (i.e., when they had feet that "tied" in terms of preference), the rankings for these feet were recorded as equal and such that the sum of all of their rankings still added to fifteen. As an example, if a person had a foot he/she considered best (ranked 1) and a foot he/she considered worst (ranked 5), but did not have a preference between the remaining three feet, these three remaining feet would all receive a ranking of 3 (1 + 5 + 3 + 3 + 3 = 15). Each participant returned to the laboratory on a different day to undergo energy expenditure testing, conducted with a COSMED K4b2 portable spirometer (COSMED Pulmonary Function Equipment; Rome, Italy). Participants were asked to fast for at least 2 h prior to the energy expenditure test to avoid effects of food digestion on the measurements. A mask with a turbine and gas sampling tube was fitted to each participant's face to measure expired and inspired air. The mask was connected to a telemetry device that recorded a number of variables, including breath-by-breath oxygen uptake (ml/min/kg). After the participant donned the system and the final step of the calibration had been completed, each participant was asked to sit in a chair for approximately 5 min to establish a resting baseline. Then the participant walked on the treadmill for 7 min with his or her usual prosthesis. The participant walked at a freely selected speed previously determined from the treadmill accommodation sessions. These speeds tended to be slower than the participants' comfortable over ground walking speeds . Each participant performed all walking trials at the same speed and at an inclination of 0?? (level). A harness connected to an overhead structure was used to ensure the participant's safety while walking on the treadmill but did not support body weight. After the participant walked for 7 min on the treadmill, the harness was detached and the participant sat in a chair to begin a resting period. Each participant rested for at least 5 min or until the previously established resting baseline was reached. During the resting period, the participant's original prosthesis was doffed and taken to another room by the study technician. The first experimental foot-pylon assembly was then attached to the socket, preserving the alignment established in the previous visit. This process was repeated for each of the five experimental foot conditions. The order in which the experimental feet were tested was assigned randomly and was potentially different from the order in which they were used in the alignment process. The research participant remained blinded to the foot condition during the collection of energy expenditure data. For most participants, the prosthesis (including the socket) was quickly removed at the start of the resting period and taken to a separate room to exchange the experimental feet. However, for cases in which sleeve suspension was used, only the foot-pylon assembly was removed at the start of the resting period, leaving the socket on the residual limb of the research participant. In all cases, the technician waited outside the laboratory after making changes to the prosthesis so as not to disturb the participant during the resting phase and inadvertently affect the energy expenditure measurements. After the resting period, the technician brought the next experimental prosthesis into the laboratory and the new foot-pylon assembly was attached or donned. Energy expenditure data were collected during each rest and treadmill walking period. The entire process was repeated for each of the five experimental feet in the study, and all energy expenditure data were collected in one visit without changing the data collection set up and avoiding the potentially confounding effects of day-to-day fluctuations in energy expenditure. Energy expenditure data were filtered with a 3-point moving average technique provided by the COSMED software. Oxygen consumption values were divided by walking speed to yield oxygen cost (ml O2/kg/m). For each 7 min walking period, oxygen cost values from the first 2 min and last 2 min were discarded. Oxygen cost and preference rankings were analyzed as a function of forefoot flexibility using repeated measures analysis of variance (ANOVA) with n = 13 and a significance level set at 0.05. 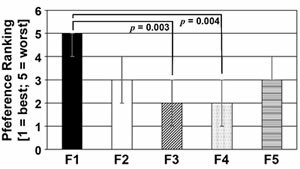 Oxygen cost was also analyzed as a function of the order in which the feet were tested using the same statistical approach to examine if participants were becoming fatigued during the testing session. The repeated measures ANOVA assumes that data are normally distributed and have sphericity. Data were checked for normality with the Shapiro-Wilk normality test. Mauchly's sphericity test was used to examine the assumption of sphericity. If the assumption of sphericity was violated, the Greenhouse-Geisser correction factor was used. The preference rankings for the prosthetic feet were not normally distributed and were therefore compared with the nonparametric Friedman test. Pairwise comparisons were made with a series of 10 Wilcoxon signed rank tests and the Bonferroni adjustment for multiple comparisons was administered, with the adjusted signifi-cance level set at 0.005. All statistical tests were performed with SPSS (SPSS, Inc; Chicago, Illinois). A total of 13 unilateral transtibial prosthesis users were enrolled in the study. The average age ± standard deviation of the participants was 53 ± 11 years, their average height was 170 ± 10 cm, and their average mass was 85 ± 12 kg. Additional participant data are shown in Table 1. All participants regularly ambulated without the use of assistive devices and had at least 1 year of experience walking on a prosthetic limb. The freely selected walking speed used during energy expenditure testing for each participant is also shown in Table 1. Oxygen cost for each participant is shown in order of decreasing forefoot flexibility in Figure 2. In Figure 3, oxygen cost is graphed in the order in which each foot was tested for each participant to investigate a possible fatigue effect. Participant data and walking speeds used during energy expenditure testing. *Supracondylar = using removable medial brim, Pin = suction suspension using gel liner with distal locking pin and, Liner suspension = suction suspension with gel liner and knee sleeve. The oxygen cost data were found to be normally distributed and to have sphericity, satisfying the assumptions of the repeated measures ANOVA. Figure 4 shows the average oxygen cost for all participants using each prosthetic foot condition. Neither prosthetic forefoot flexibility (p = 0.17) nor the order in which the feet were tested (p = 0.94) and had a significant effect on oxygen cost. The remaining 3 min from the middle of the walking period were averaged to determine the mean oxygen cost for that trial. 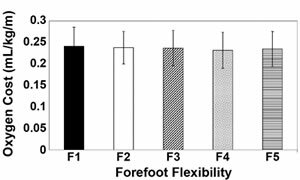 Subjective preference rankings for the prosthetic feet used in this study varied between participants (Table 2 and Figure 5), but were significantly affected by forefoot flexibility (p = 0.002). Participants tended to dislike the most flexible foot (F1). 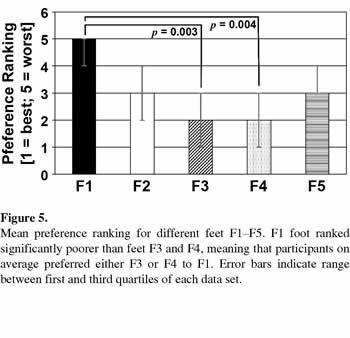 As a result, the F1 foot scored significantly poorer in preference ranking than the F3 (p = 0.003) and F4 foot (p = 0.004), indicating that participants preferred the F3 or F4 feet to the F1 foot (Table 3). Subjective preference rankings for five prosthetic feet (F1-F5) by each research participant (1 = best, 5 = worst). Test statistics (p-values) resulting from Wilcoxon signed rank tests on subjective preference ranking data. *Significant at Bonferroni adjusted level of 0.005. The F3 prosthetic foot was developed to conform to an effective rocker radius of approximately 35 percent of the user's leg length, the median radius found from walking data of 24 young nondisabled persons . Adam-czyk et al. studied a group of nondisabled persons walking with constrained ankle and rigid rockers under both feet . In their study, they found a minimum energy was needed to walk when using rockers equal to about one-third of the leg length, suggesting that a biomimetic rocker radius may provide an energetic benefit. In this study, we hypothesized that participants would display the lowest oxygen cost while using the foot developed to have biomimetic flexibility (F3). However, the results of this study did not support our hypothesis. The study by Adamczyk et al. placed constraints on both legs of nondisabled persons , while this study affected only the prosthetic side of unilateral transtibial prosthesis users. Since only one side of the body was affected by our intervention, it is possible that the other side compensated in some way for the changes made to the prosthetic foot, resulting in oxygen cost remaining the same. Additionally, the prosthetic feet in our study conformed to rocker shapes through flexibility, storing and releasing energy, while Adamczyk et al. 's rockers were rigid . Lastly, the Adamczyk et al. study likely used a wider range of rocker radii than the effective rockers of the feet used in this study. Their metabolic rate versus foot radius curve has a fairly wide "valley" near the minimum. The effective rocker radii of feet used in this study, as estimated from measurements made during the gait analysis session , most likely resided within this valley. Walking speeds during energy expenditure testing on a level treadmill varied from 0.65 to 1.20 m/s. This range of speeds is slower than the typical nondisabled walking speed of 1.37 m/s . Research has shown that oxygen cost increases when walking at speeds that are greatly above or below a participant's comfortable walking speed . Significant differences in oxygen cost may have been detected if the prosthetic feet were tested at faster walking speeds. However, we decided to test freely selected speeds that would better represent everyday usage. Also, the additional time needed to include testing at fast walking speeds during a single testing session would have overburdened many of the research participants and possibly led to fatigue effects. Although oxygen cost was not affected by the forefoot flexibilities of the prosthetic feet in this study, participants preferred either the F3 or F4 feet and disliked the most flexible foot (F1), supporting our second hypothesis. Use of the F1 foot led to a noticeable "limp" in many of the participants' gaits and many complained that the foot had insufficient forefoot support during walking and standing. The lack of forefoot support in the F1 foot led to a "drop-off" effect during terminal stance on the prosthetic side and an increased loading on the sound limb . It is not clear whether the preference ranking results relate to F3 and F4 feet having flexibilities closer to that of the nondisabled ankle-foot system, yielding better function for walking, or to these feet more closely matching the flexibilities of their usual prosthetic feet. 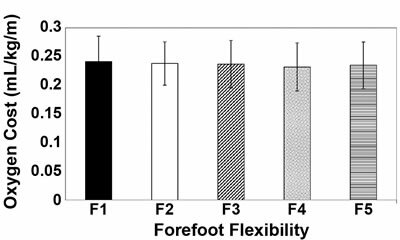 A study of persons who are used to highly flexible feet may yield completely different results in terms of subjective preference. The prosthetic feet used in this study had solid ankles and flexible keels. Most of the energy storage and return in the experimental prostheses occurred within the keel structures of the feet. Results would possibly differ when prosthetic systems are used that also incorporate flexible shank regions, such as those found in the Flex-Foot (? ?ssur; Reykjavik, Iceland). However, as mentioned earlier, several studies have still found no difference in energy expenditure when the Flex-Foot is used compared with the SACH foot [4-6]. A limitation of this study was the use of a treadmill for energy expenditure testing. Measuring each participant's oxygen cost while walking overground would have better represented everyday walking. However, the use of a treadmill allowed data collection to take place inside a controlled laboratory setting, eliminating potentially anxiety-inducing distractions that can affect energy expenditure measurements. Also, the treadmill provided a constant measured speed throughout testing, a factor known to affect oxygen cost. Most participants held on to the treadmill handlebar during walking, with the exception of participants 3 and 7. Holding on to the treadmill handlebar could have potentially altered gait, and participants could have used their arms to compensate for the differences in the prosthetic feet. However, participants 3 and 7, who did not use the treadmill handlebar, still showed no noticeable differences in oxygen cost between the different feet. Another limitation to the study was the short accommodation time each participant had with each prosthetic foot before testing began. Allowing participants a greater accommodation time with each prosthetic foot may have shown data that better represented long-term use. Participants may have formed different opinions and rankings of the feet if they had had more time to accommodate. Our study did not incorporate extensive mechanical testing of the experimental feet and commercially available feet; therefore, whether the experimental feet in this study represented the range of flexibilities seen in commercially available feet is unclear. From our earlier unpublished examinations of commercially available prosthetic feet, we had found that their roll-over shape radii in quasistatic testing can be as low as 15 percent of leg length to as high as 55 percent of leg length for a series of commercially available prosthetic feet. Our foot conditions were designed to cover this range of roll-over shape radii. Unfortunately, the measured roll-over shapes for the most flexible feet (F1 and F2) in the gait analysis part of the study were found to be highly variable and generally higher than their designed values . This problem potentially arises because the moment arm for each cut is reduced in the F1 and F2 conditions, not allowing the cuts to close in the appropriate timing to achieve the designed roll-over shape radius. Despite these problems, the experimental prosthetic feet were successful at providing different levels of flexibility necessary for investigation of the research hypotheses. Future research should focus on the development of standard functional tests for prosthetic feet, which would allow for easier comparison of prosthetic feet used in research studies (experimental or otherwise) with feet that are commercially available. When the prosthetists dynamically aligned the prosthetic feet in this study, they likely made adjustments to account for the different flexibilities of each foot. Therefore, each experimental condition tested was a combination of prosthetic foot and alignment changes. The sliding adapters used on the experimental prostheses are designed to allow fore-aft translational adjustments as well as the typical sagittal and coronal plane rotational adjustments. The prosthetists apparently made most use of the sliding adapter when aligning the more flexible feet, sliding them forward with respect to the prosthetic socket. Such adjustments may have "nested" the resulting rocker shapes created by the different prosthetic feet, as seen in a previous prosthetic alignment study , minimizing the differences between feet to a larger extent than if they were tested using the same alignment. We chose to have each prosthetic foot dynamically aligned by the experienced prosthetists because this approach most closely reflects clinical practice. Although unintentional, all prosthesis users in this study had their amputations as a result of nonvascular causes. Results possibly would be different in persons with amputation as a result of vascular disease. Specifically, persons with amputation as a result of vascular disease or diabetes tend to be older and some have diminished sensation that can lead to poor balance and reduced reaction times. These differences may make the choice of flexibility in a prosthetic foot more critical because the ability of these persons to compensate for differences in prosthetic feet may be diminished. Persons with balance issues may be at a greater risk of falling with prosthetic feet that are overly flexible. One participant in this study noted that the F5 foot was very stable for standing and she demonstrated by balancing on only the prosthetic foot. Several other participants in the study stumbled when first trying to stand and walk with the F1 prosthetic foot (before alignment and accommodation to the foot). This study tested only walking function with the prosthetic foot, although feet are used for many other functions. Much more information is needed to provide clinicians with useful guidelines for the prescription of prosthetic feet. The oxygen cost of unilateral transtibial prosthesis users was not significantly affected by the forefoot flexibility of the prosthetic feet used in this study. However, subjective preference rankings for the experimental feet were significantly affected by forefoot flexibility, with many of the participants disliking the most flexible forefoot. Future research in this area could examine the relationship between a prosthesis user's functional ability and roll-over properties of prosthetic feet. Studies could control for the cause of amputation and K-level1 of research participants. Further studies with longer accommodation periods should also be conducted with experimental components such as those used in this study. These types of components could also be used to study other functional tasks such as standing, sit-to-stand, and ambulation on nonlevel terrain. For example, the energetic effects of differences in prosthetic foot design may become more pronounced with longer usage time, giving the system more time to adapt to a new status quo. Study concept and design: A. Hansen. Acquisition of data: E. Klodd, A. Hansen. Prosthesis fitting: M. Edwards, S. Fatone. Analysis and interpretation of data: E. Klodd, A. Hansen, S. Fatone, M. Edwards. Drafting of manuscript: E. Klodd, A. Hansen. S. Fatone, M. Edwards, A. Hansen, E. Klodd. Statistical analysis: E. Klodd, A. Hansen, S. Fatone. Funding/Support: This material was based on work supported by the VA, Veterans Health Administration, Rehabilitation Research and Development Service (grant A4325R). The research was conducted at the VA Chicago Motion Analysis Research Laboratory of the Jesse Brown VA Medical Center in Chicago, Illinois. Additional Contributions: The authors acknowledge Rebecca Stine, MS, for her help in data acquisition; Kerice Tucker, BS, for his help in mechanical testing of the feet; and Walter Afable, CP, for his help in recruiting participants for the study. Institutional Review: The research protocol and informed consent process was approved by both the Northwestern University Institutional Review Board and the Research and Development Committee of the Jesse Brown VA Medical Center. All participants completed the informed consent process before participating in the study. Participant Follow-Up: The authors do not plan to inform participants of the publication of this study. 2. Waters RL, Perry J, Antonelli D, Hislop H. Energy cost of walking of amputees: The influence of level of amputation. J Bone Joint Surg Am. 1976;58(1):42-46. 3. Gonzalez EG , Corcoran PJ, Reyes RL. Energy expenditure in below-knee amputees: Correlation with stump length. Arch Phys Med Rehabil. 1974;55(3):111-19. 4. Nielsen DH, Shurr DG , Golden JC, Meier K. Comparison of energy cost and gait efficiency during ambulation in below-knee amputees using different prosthetic feet. J Prosthet Orthot. 1989;1:24-31. 8. Barth DG , Schumacher L, Thomas SS. Gait analysis and energy cost of below-knee amputees wearing six different prosthetic feet. J Prosthet Orthot. 1992;4(2):63-75. 12. Torburn L, Powers CM, Guiterrez R, Perry J. Energy expenditure during ambulation in dysvascular and traumatic below-knee amputees: A comparison of five prosthetic feet. J Rehabil Res Dev. 1995;32(2):111-19. 14. Hansen AH. Roll-over characteristics of human walking with applications for artificial limbs [dissertation]. [Evanston (IL)]: Northwestern University; 2002. 16. Klodd EJ. The effects of prosthetic foot roll-over shape radius on gait of unilateral transtibial prosthesis users [master's thesis]. [Evanston (IL)]: Northwestern University; 2008. 19. Rose J, Gamble JG. Human walking. Baltimore (MD): Williams & Wilkins; 1994. 20. Hansen AH, Meier MR, Sam M, Childress DS, Edwards ML. Alignment of trans-tibial prostheses based on roll-over shape principles. Prosthet Orthot Int. 2003;27(2):89-99. Submitted for publication January 14, 2010. Accepted in revised form April 7, 2010. 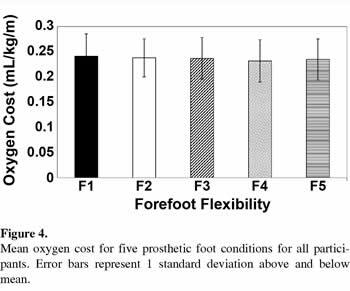 Klodd E, Hansen A, Fatone S, Edwards M. Effects of prosthetic foot forefoot flexibility on oxygen cost and subjective preference rankings of unilateral transtibial prosthesis users. J Rehabil Res Dev. 2010;47(6):543-52.